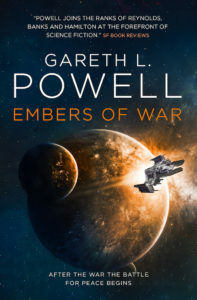 An hour-long conversation with British author Gareth L. Powell, exploring the creative process behind his works of science fiction, with a special focus on his latest novel, Embers of War (Titan Books), first in a new trilogy. 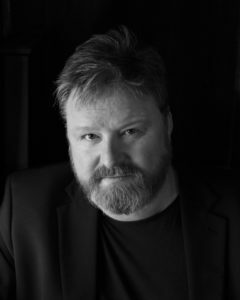 Gareth’s other books include Fleet of Knives (Book 2 in the Embers of War trilogy, coming out February 19, 2019 from Titan Books), Light of Impossible Stars (Book 3, due out February, 2020), Hive Monkey, and Macaque Attack (Books 2 and 3 in the trilogy that began with Ack-Ack Macaque), The Recollection, and Silversands, as well as the horror novella Ragged Alice, and the short fiction collections Entropic Angel and The Last Reef. His novels have been translated into French, German, Japanese, and Czech, and his short stories into many other languages, including Greek, Polish, Portugese and Hebrew. His short fiction has appeared in Interzone, Clarkesworld, and The Year’s Best Science Fiction, and his story “Ride The Blue Horse” was shortlisted for the 2015 BSFA Award. Gareth was born and raised in Bristol, UK, and was once fortunate enough to have Diana Wynne Jones critique one of his early short stories over coffee. Later, he went on to study creative writing under Helen Dunmore at the University of Glamorgan. He has run creative writing workshops and given guest lectures at several UK universities, including Aberystwyth, Bath Spa, Bucks New Uni, and York, as well as at the Arvon Foundation in Shropshire, and the Bristol Literature Festival. Luna Press will publish About Writing, his field guide for aspiring authors, in 2019. In addition to his fiction, Gareth has written for The Guardian, The Irish Times, 2000 AD, and SFX. He has also written scripts for corporate training videos, and is currently at work on a screenplay. He lives near Bristol and is represented in all professional matters by Alexander Cochran of the C&W literary agency. 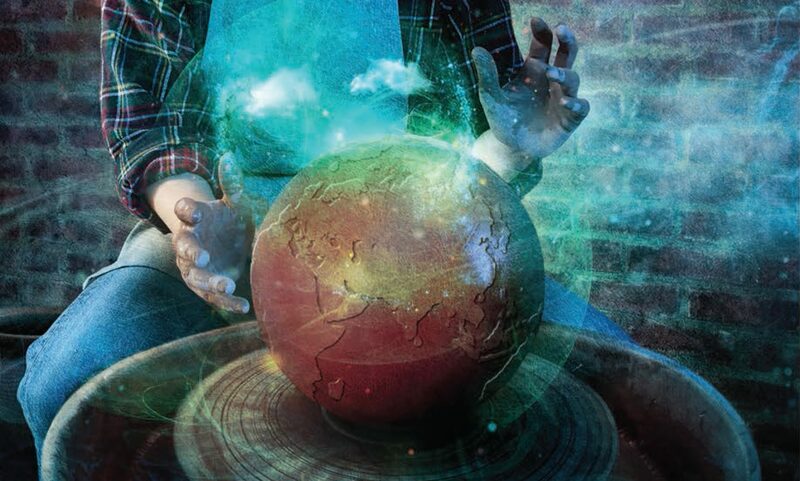 After noting that Gareth is the first guest on The Worldshapers Ed has never met before, we begin with the usual question of how long Gareth has been interested in writing and the fantastical. He read his way through the big shelf of science fiction at his local library, from the books for younger readers all the way up to people like Arthur C. Clarke, Larry Niven, and Robert Heinlein. Writing was always in the cards, he says, but he never thought he’d have the stamina or time to write a novel, and certainly didn’t think you could do such things as a real job. Then is fiancée (now his wife) gave him a copy of Neuromancer by William Gibson, and “that just about changed everything,” because it showed him heroes don’t have to be hyper-capable Star Fleet captain. “This was science fiction at the level of the street,” he says. “It’s like what people say about the first Velvet Underground album, which was that everyone who bought a copy of it started their own band.” He realized he didn’t have to write like the authors he’d grown up reading, he could write the stuff he wanted to write, that was more meaningful to him: in effect, Gibson gave him permission to do what he wanted to do. Gareth is definitely a science fiction author, not a fantasy author. He notes that he read a lot of Michael Moorcock as a teenager, “and that kind of did fantasy for me…I kind of got my fill of it.” He admits he’s never made it to the end of the Lord of the Rings, either in print or on film. He hastens to add he has nothing against fantasy, he just can’t immerse himself in it. Then he won a competition his English teachers had entered one of his stories in, to have coffee with Diana Wynne Jones. He went into town to a cafe, and “this kind of wild-haired wonderful lady came in and sat there and took me task for a line where the heroine sighed when she saw a spaceship taking off.” He says she opened his eyes to a lot of things, and that was a turning point for him. Gareth admits he used to write to annoy that tutor in a way. He’d make a big pronouncement about not liking poetry without punctuation, so Gareth would submit a completely unpunctuated poem. He used to sneak in science-fictioni “easter eggs” in the background of literary stories. He says it boiled down to students telling other students how they though their work should be written, which he found “excruciatingly unhelpful.” He wanted authors and editors to tell him how things should be written. That’s one reason he goes out of his way to help aspiring writers–conducting university workshops for example, talking about the brass tucks of writing as a career, and that’s why he’s bringing out his book On Writing, “a field guide for aspiring authors,” next year. His own first foray into commercial novel writing was Silversands. When he finished it in 2002 it was only 49,000 words. He’d read that 40,000 words made a novel, and didn’t realize most publishers were looking for much more. He shopped it to agents, and didn’t really get anywhere. He’d been toying with the idea of a whodunit set aboard a giant, floating, city-sized zeppelin, and he had the character of Ack-Ack (who is, indeed, a macaque) from a short story, and he found the two slotted together. The result was a murder mystery thriller set in an alternate universe, in which Europe is politically aligned a bit differently than in ours. The cover featured a monkey in a Second World War pilot’s outfit, complete with cigar and massive gun. The cover caught people’s attention, Brett said, and though some thought it must be a one-joke, simplistic kind of story, those who picked it up found something more serious…serious enough to become a trilogy, in fact, although he didn’t intend for it to be one. The first book created so much attention even that the second book was commissioned before it was even published, he says, adding it was a lot of fun to see a character he’d originally created for a short story to go on to star in a huge trilogy. With Embers of War, he says, the closest thing he had to one big idea behind t was something he read about how the sinking of the Titanic wasn’t the first ocean liner disaster or even the worst, but the first where the ship had radio and could call for help, so that there were survivors who could tell the tale. “Before, liners just sailed off into North Atlantic never to be seen again,” he notes. He transferred that to outer space, thinking, “wouldn’t it be great if there was a rescue organization that could go out and rescue these stranded spaceship.” That got him thinking about where these ships would come from, who would crew them, etc., and that brought in the idea of people who had fought on different sides of a war now working together for good. “Once the characters come through, the book’s off and running,” he says. For most of his books, there’s not a lot of research involved. He did do some research into European politics of the 1950s for the Macaque books, since it’s based on an alternate history in which the UK and France have merged politically, to the annoyance of the Americans, but for Embers of War, not so much, because “nobody knows how a faster-than-light engine works.” In fact, he says, the main bit of research he did was into the correct method for performing a chest drain on someone who’s been shot in the chest. One of the most interesting characters is Trouble Dog, the sentient ship, “a killing machine that is accidentally developing a conscience.” He notes that a lot of the book is about the ship’s struggle to come to terms with who she is and what she’s done in the past. He also had a sentient ship in The Recollection. In Embers, the ship is a character because it seemed to him that if he wanted soldiers from this big interstellar war as characters, those soldiers would actually be the ships, which could think faster, act faster, and were thousands of times more powerful than humans. “If they’re sentient, that gives them a chancne to understand what they’ve done and what they’ve been through,” especially since the core of their brains are actually created from cloned stem cells, which are allowing emotions to leak through into Trouble Dog. “It’s as if one of the star destroyers in Star Wars started saying, ‘Hang on a minute, why are we shooting all these rebels down? '” Gareth says. Another interesting characters is the alien, Nod. “At heart his motivation is just to keep the ship flying,” Gareth says. A spider-like creature, Nod grew up on a planet where there’s just one big tree, the World Tree, and his species evolved to fix the tree and maintain it. As a result, they’ve become the default species for ships’ engineers. Nod speaks in a very clipped, simple fashion, repeats himself a lot, and mutters to himself, but “in amongst all the muttering and complaining and grumpiness some pearls of wisdom.” In some ways he’s the wisest of the characters, Gareth says, even though the rest of the crew treat him a bit like a piece of furniture. Gareth says he doesn’t do a lot of rewriting: instead, he edits on the fly as he’s writing, so that he has fairy clean draft when he reaches the end. He’ll go back to check for errors and smooth any clunky writing, then he sends it to his agent, who returns it with suggestions, and then to the publisher, who of course also returns suggestions. “Usually they’re fairly minor,” he says. Fleet of Knives, out in February 2019, takes what seems to be a good thing at the end of the first book, an event that gets the heroes out of trouble, and makes it clear it’s not as beneficial as they’d expected. He promises new characters and new places to venture, while the consequences of the first book rebound through his universe. Ed asks Gareth if he agrees with the notion that even those who claim to be writing realistic “literary” fiction are in fact making up worlds as imaginary as those of genre writers. As for why he, personally, writes stories?